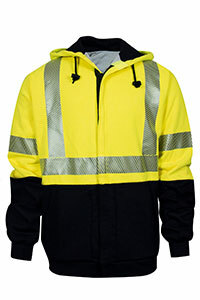 Be seen in a whole new way with the VIZABLE® FR hi-vis hybrid zip front hoodie with liner. Ideal for cold weather with its waffle weave lining, this zip front hoodie will keep you warm. Working around a flame or arc flash hazard? No worries. The CAT 3, 20 cal hybrid FR sweatshirt is inherently flame resistant and will NOT melt, drip, or ignite. Segmented silver reflective and the vibrant hi-vis yellow meet ANSI 107 Type R Class 3 - and the hybrid color blocked design delivers clean style. A generous fit and rib knit cuffs and waistband keep your sweatshirt in place: the VIZABLE® FR hi-vis sweatshirt will be your new favorite hoodie.